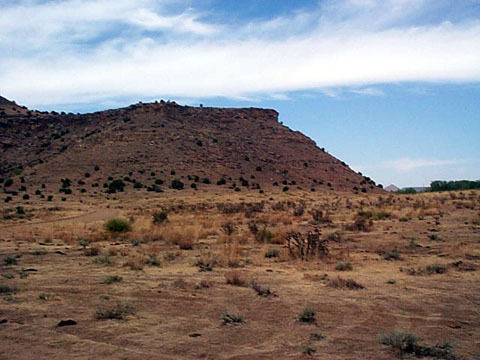 At 4,973 feet above sea level, Black Mesa is the highest point in Oklahoma and is marked with a monument atop the mesa. A hike to the top takes about 3 hours. At the foothills of the Rocky Mountains, Black Mesa and the surrounding area provide one of the most dramatic landscapes in Oklahoma. Points of interest around Black Mesa include Dinosaur Quarries opened and excavated in the 1930s. More than 18 tons of fossilized prehistoric animal bones have been excavated and a concrete replica of a femur bone from a brontosaurus is in place on the site of the quarry from which the skeleton was taken. Dinosaur tracks are visible in a nearby creek bed. The region contains the fossilized remains of dinosaurs from the Jurassic and Triassic Periods, which date back as far as 140 million years ago. Interesting rock formations dot the area, such as "Old Maid's Profile" and the "Wedding Party," complete with bride, groom and a minister. Numerous Indian writings and drawings by prehistoric Indians can be seen on the rocky walls of many canyons throughout the area. Black Mesa gets its name from the thick layer of black rock which caps the mesa. This rock was formed from a lava flow which covered this region about 30 million years ago. It is about 45 miles long and extends into the Oklahoma Panhandle from Colorado. This nearly perfectly-shaped cinder cone stands more than 1,200 feet above the surrounding high plains of northeastern New Mexico. 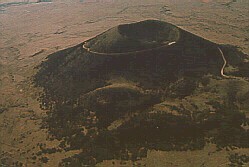 The volcano is long extinct. Today, the forested slopes provide habitat for mule deer, wild turkey, black bears and other wildlife. Abundant displays of wildflowers bloom on the mountain each summer. A twenty mile paved road spiraling to the volcano rim makes Capulin Volcano one of the most accessible volcanoes in the world. Trails leading around the rim and to the bottom of the crater allow a rare opportunity to easily explore a volcano. The Black Mesa area, southeastern Colorado and northeastern New Mexico are simply some of the most beautiful countryside in the southwest offering opportunities for hiking, horseback riding, cycling, rock hounding, photography and other activities. Longer day trips or an overnight stay can be planned to Taos or Santa Fe for a bit of southwestern art shopping. Got a little history in mind? Fort Union on the Santa Fe Trail is a longer day trip away just north of Valmora, New Mexico and of course the Santa Fe Trail passed through the Black Mesa area. The Cimarron Heritage Center in Boise City is a great place to start your own trail of historical exploration. You can also stop in at the Kenton Museum for a bit of local lore and history. Note: The Kenton Mercantile is CLOSED.